Sturdy, reliable reels, multipliers can do battle with the toughest of customers – the stocky ballan wrasse included. Sometimes you’ll find it necessary to set the drag on full power so the spool will not give line; this is called total lock-down. 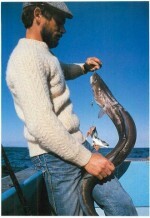 It is essential when fishing for conger over wrecks. 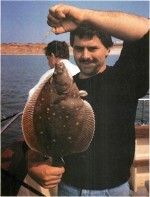 After the hook is set, the fish must be pumped away from the danger zone of rusting plates and pipes. If the eel takes some line, it could retreat to the safety of the wreck, breaking the line and getting away completely. This is a ‘risk all’ situation. Once the conger has been worked into safer water, the clutch pressure is reduced so the fish can take line. The standard beachcasting reel has a wide spool, a star drag and high-speed retrieve to wind in line quickly. The spool tension adjusting screw through the centre of the reel is not used as a brake: tightening it causes wear and can shorten the life of the reel. 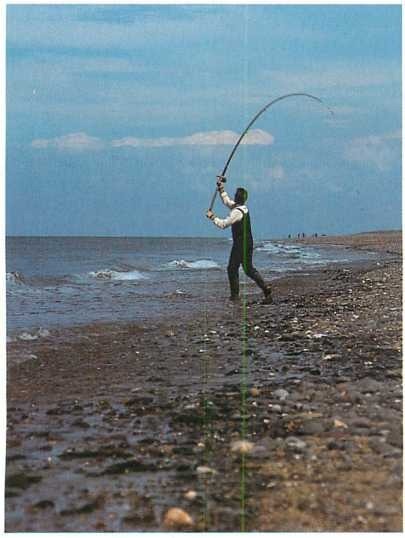 Shore anglers often remove the level wind from their reels; they claim that by doing so, they can gain 10-15yd (9-14m) when casting. A disadvantage of removing the line distributor is that you must then use your thumb to feed the line evenly across the spool. A smaller-sized multiplier is an excellent reel for casting spoons and spinners for bass in the shallow surf. It can also be used for mackerel and other summer fish which strike at artificial lures. Fishing with light equipment (10ib/4.5kg line and a small bass rod) can be very exciting – especially when a hooked fish makes a long, hard run. Centrifugal brakes have two plastic pegs on the spindle of the spool. As the spool turns, the pegs push against the frame, creating friction. You cannot adjust this type of brake – though you can remove the pegs to make the spool completely free-spinning, but this is not recommended. 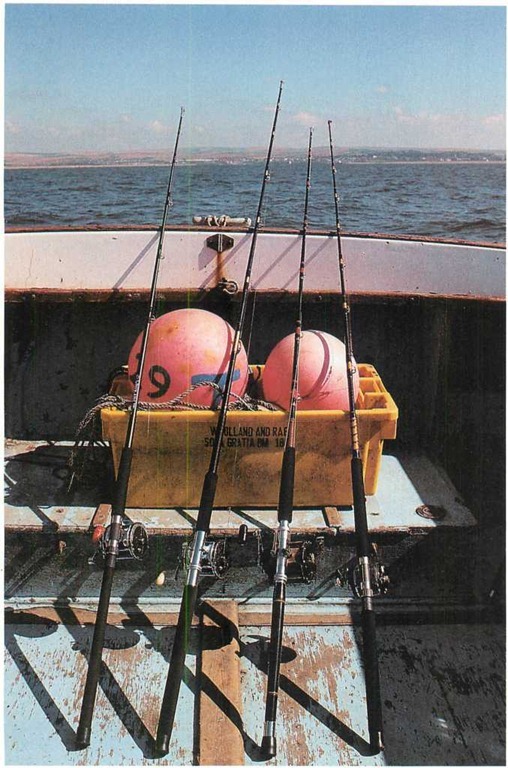 Compared with reels for uptiding (far right), reels for wreck fishing need large, strong spools and low gearing to pump up coalfish, pollack and conger. A quality multiplier is essential when playing marlin, tuna or other big-game fish. The shoulder harness is clipped to the front of the reel. Practice and patience are important aspects in mastering beachcasting with multipliers. The two main types of sea reels are skirted spool (fished underneath the rod) and multipliers which are fished on the top of the rod. Many beginners prefer skirted spool reels simply because they’re easy to use – you just hold the line, push the bail back and cast away. 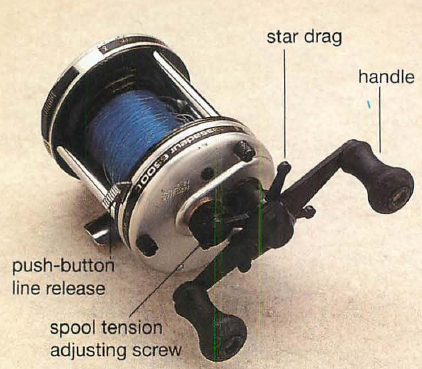 But skirted spool reels can be awkward – especially when reeling in or when playing a fish. The name ‘multiplier’ refers to the gear ratio between the spool and the handle the spool, for example, rotates two, four or even six times with one complete turn of the handle. This is written as 2:1, 4:1 or 6:1. 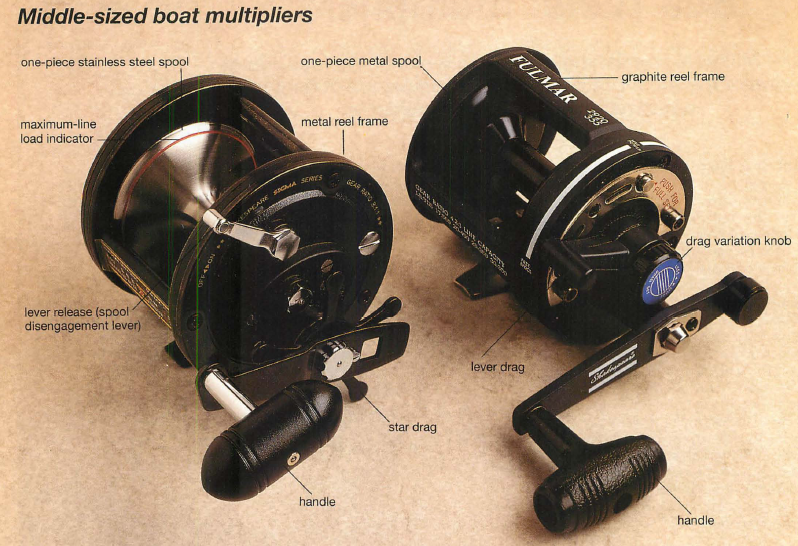 Small multipliers feature high gearing to retrieve line quickly, and the big ones have low gearing for greater winding power against large fish. Multipliers have proven themselves through the years. Their main parts include the drag systems, spools, ratchet, braking, line distributors (on some models) and reel frames. Drag systems The most important feature (and the weakest part of a multiplier) is the slipping clutch mechanism, also called the drag. In a cheap model the drag is one of the first things to wear out, but if you buy a top-name multiplier you won’t go far wrong. The drag can be set precisely to suit the strength of line loaded on the spool. When a fish runs, the clutch allows line to be taken off, reducing the possibility of line breakage. There are two types of drag. The star drag is controlled by a wheel, located between the handle and the reel frame. The opposite end of the handle is counterweighted, so the spool distributes line evenly. Turning the star forward increases the drag while turning it backwards (towards you) decreases it. Until fairly recently the lever drag, a second type, was beyond the reach of the average fisherman because it was too expensive. Now, however, prices have come down, and it is becoming more popular than ever. The star wheel is replaced by a single lever which operates in an arc across the right side of the reel frame. The farther forward (clockwise) it is pushed, the greater the drag on the spool. The spool on a lever drag reel is disen- gaged without the use of a button. You must push the lever fully back (anti-clockwise) to release the spool. Spools Many beachcasting reels come with plastic spools which are fine for light angling. 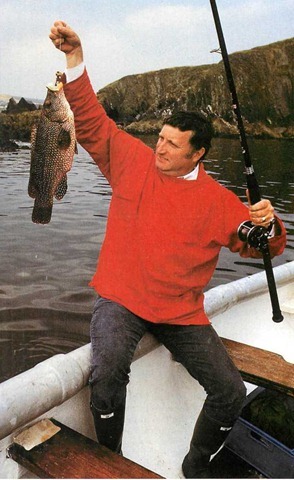 But when it comes to boat fishing, a strong spool, made of aluminium or stainless steel, is essential. 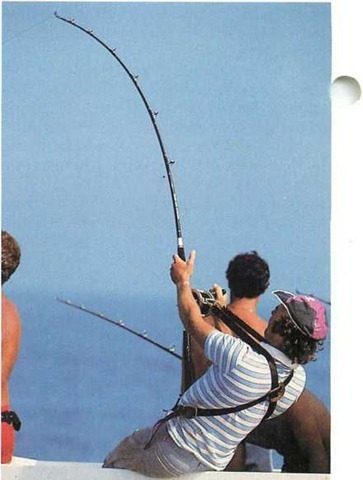 Spools can easily distort (or even explode) under the strain of playing large fish. Ratchet or check switch With the check ‘on’ and the line disengagement lever (or button) off, the line will not spill off the spool. When a fish takes the baited hook and runs, it is allowed line, but its departure is signalled by a loud shriek. Many anglers don’t take advantage of this alarm system. Some use it incorrectly — with the drag backed off instead of with the spool disengaged, so when a fish swims off with the bait, they must set the clutch and click the check button off, a process which takes time. 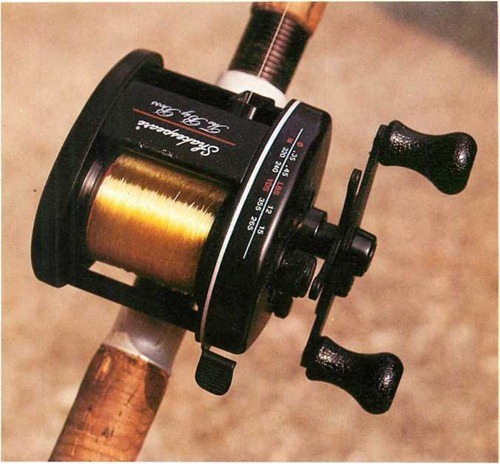 When you use the check button correctly – with the spool disengaged – it takes an instant to pick up the rod, engage the spool and disengage the check button. A multiplier should not be used with the check in the ‘on’ position, nor should the ratchet be switched off before the spool is engaged. Braking Many multipliers (especially the beachcasting ones) have ‘braking’ systems — usually either centrifugal or magnetic. They can help to avoid the dreaded bird’s nest’ (backlash) – when the spool of the reel turns faster than the line is going out, creating a large tangle. Centrifugal brakes usually have two pegs (located on a spindle on the spool) which push out as the spool turns, causing friction on the rim of the reel frame. The faster the spool turns, the more the pins push out on the frame, slowing down the spool. A disadvantage of this type of braking is that you can’t adjust the pegs as your casting proficiency increases though you can remove them completely. Magnetic brakes are two series of eight to twelve magnets lining the exterior of the frame and the outer edge of the spool. As the spool turns a magnetic field is produced between the two sets of magnets, slowing down the spool. The closer the magnets are positioned to each other, the greater the magnetic field and the slower the spool turns. This type of brake can be adjusted as your casting skills improve; the magnets can even be removed so that your spool is completely free-running. Line distributor (level wind) As the line is reeled in, the level wind lays it evenly across the width of the spool. By removing the line distributors from their reels, shore anglers claim they can gain 10-15yd (9-14m) when casting. A disadvantage of removing it is that you must then use your thumb to feed the line evenly across the spool – a process which some anglers pick up quite easily while others are less successful. Some multipliers have an arm which moves back and forth across the spool. This works well in light to medium-weight boat fishing and beachcasting, but beyond this you are asking the mechanism to perform above its capability. A stronger line distributor is the spiral-bar type which does not have a line guide and which moves across the reel face. Line coming in follows the low point of a spiral bar before going on the spool. Frames The range of reel materials increases as technology continues to develop new materials. Stainless steel and aluminium have given way to graphite -now used for many components. It is extremely tough, ultra light and can be moulded and machined with great precision. Add this to titanium drags and other materials which owe their origins to the space programme, and the angler of today has never been better served. 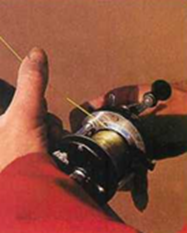 Before you fill the reel with monofilament line, apply a soft, pressure-absorbing backing to the spool – wound monofilament line builds enormous pressure; try winding a short length of line around your finger to prove the point. Practice The multiplier is an easy reel to use – although many anglers believe that it is difficult – but control must be perfected. The only way to achieve this is through practice. When letting your bait drop down, you must keep the free-running spool from over-running. Your thumb makes an effective brake. When casting, you need to monitor the spool. Failure to control it results in tangles. Maintenance The reel frame should be able to stand up to the corrosive effect of saltwater. But you must play your part, too. At the end of a day’s fishing, rinse your reel in freshwater, allow it to dry in a warm room and oil it. 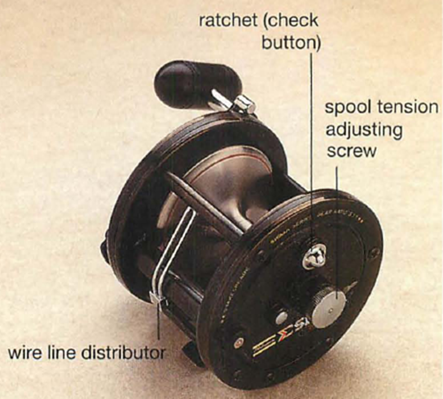 If properly looked after, a good reel will give years of trouble-free service.